Alba is a modular wall shelf that offers space to hide or display objects in any room of your home with a sculptural flourish. Alba means “sunrise” in Spanish, hence its name, since the two front pieces of the product simulate the sun and the moon reflecting in the water when a new day dawns. Alba M is a piece of contemporary design ready to be customized, you can configure more than 10,000 different options due to its multitude of shapes and finishes available. It works both right and left, it’s the user who chooses the position before its easy setup. Modular wall shelf with a sculptural touch that brings personality and elegance to your home. Alba is basically composed of 3 flat pieces of Plywood and a metal bracket that is fixed on the wall. 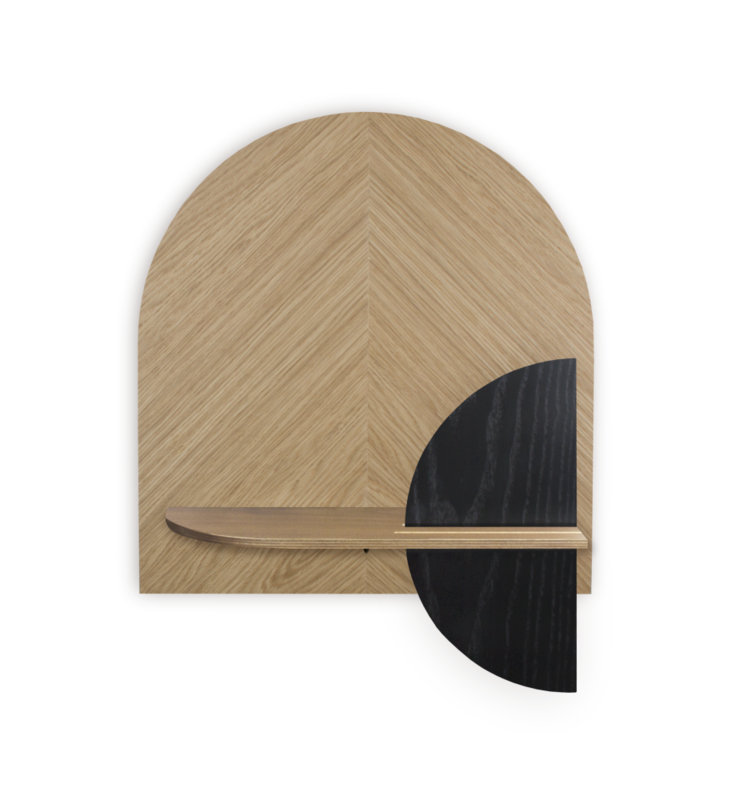 The arrangement of these pieces in the space gives the product the ability to hide objects behind the vertical pieces since there is a separation between them. In the night table version (L), we have a back space, behind the bottom piece, which allows us to hide larger objects such as books, tablets, etc. Also, there is a hidden hole in the base that allows us to feed the cable to charge our devices. There are finishes in natural wood such as oak and walnut, but also colour finishes applied on ash wood; white, black, grey and blue.